Jeremy Deans is a structural geologist who is on board the JOIDES Resolution right now as part of the Superfast expedition science party. To find out why he rules, read on. As a structural geologist, Jeremy looks at the shapes of rocks to see how they have changed over time. The shapes he sees can help him figure out what forces caused the rocks to change. As an example, lets say you had a cardboard box full of stuff in your room and one day you walked in and the box suddenly looked less like a box and more like an accordion. The shape of this deformed, crushed box is a clue that some sort of force acted on it. Since the shape looks like the box was crushed from above, you do further investigation and find out it looks that way because your sister sat on it. The shapes of rocks also provide clues to how they were changed, though the forces that deform rocks are much stronger than the force your sister enacts when she sits on something. This photo and the photo in the teaser image above were both taken by Mark Kurz. Jeremy also looks at the rocks under the microscope. The shapes of crystals in the rocks can also show change. Below are two photos of gabbro under the microscope. The one on the left is not deformed and the one on the right is deformed. Since you can learn a lot from the shape of a rock or the shapes of the crystals within a rock, one of the things the scientists are hoping to learn from this expedition is how the ocean crust forms. Scientists have come up with some models to try to understand this. One model predicts the shapes of rocks will change a great deal the deeper you go into the ocean crust. Another model predicts the shapes of rocks will not change much at all the deeper you go. Because this is the first expedition to drill this deep into the ocean crust and see the shapes of rock deep down, Jeremy is helping determine which ocean crust model is more accurate. Jeremy did not always want to be a structural geologist. When he was a kid growing up in the Finger Lakes region of New York* he was mainly interested in sports. He had an interest in science, though, and when he took a chemistry course his junior year in high school and realized he was good at it, he started thinking about becoming a scientist. He decided to become a geologist, because it allows him to study chemistry and physics, which he really likes, but it also allows him to work outdoors while doing research, which he also really likes. 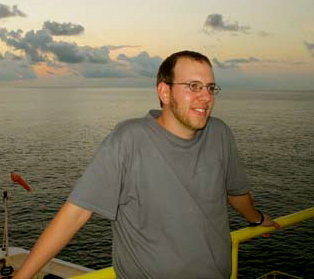 Jeremy is currently working on his Ph.D. degree in geology at Texas Tech University in Lubbock, Texas. ** Jeremy has really enjoyed being on the JOIDES Resolution. He likes spending time with people from all over the world who have similar interests to him, and learning from the different scientists on board with him in the science party. If you would like to be a geologist like Jeremy, he says there is much for future geologists to study and explore because there is still a lot we do not know about the Earth. He says if you find something you love about geology and work hard at it, it will be a very rewarding and fun career. *Lots of cool people grow up in the Finger Lakes region of New York including Twilight Zone creator Rod Serling, mediocre president Millard Fillmore, heavy metal singer Ronnie James Dio and the guy who helps me write these blogs. **Lots of cool people grow up in Lubbock, Texas too, like early rock-n-roll singer Buddy Holly. We blogfish think Buddy Holly rules, so go download all his songs right now.